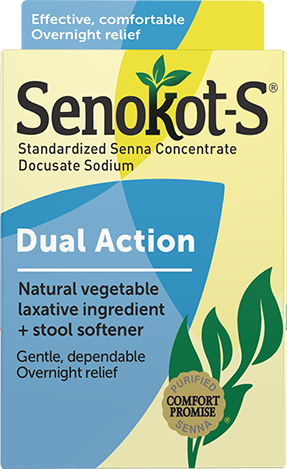 Senokot-S® Dual Action combines the natural vegetable laxative ingredient of Senokot, senna, with a stool softener for dependable, overnight relief of occasional constipation which may be associated with certain prescriptions and over-the-counter medications. Available in packages of 10, 30, and 60 tablets, Senokot-S® provides gentle relief and eases the discomfort associated with hard, dry stools. Taking your dose of Senokot-S® at bedtime is recommended to help relieve constipation overnight. Refer to the Senokot-S® Laxatives package for dosing instructions or see the Directions below. Whenever you are unsure about what to do, please call your physician or pharmacist for advice.